Water Well & Pump Service Design, Service, and Installation Well Done! Our well rehabilitation in Illinois services are able to bring back to life some wells that had been on the verge of abandonment. Well rehabilitation has come a long way in the past few years. There are many great ideas coming from the industry and the advancement of technology. Airburst® and Hy-RIP® systems are just a couple of the great well rehabilitation systems that are in use today. If for any reason you have any questions or comments about well rehabilitation in Illinois, feel free to give us a call at 888-769-9009 or fill out the form to the right and an associate will respond shortly. There is no other company that has the knowledge, and application experience that Water Well Solutions has to offer for well rehabilitation in Illinois. Our team of industry experts develop and utilize unique water well technologies to provide the best solutions for your well rehabilitation in Illinois. It is our goal to provide our clients with the highest quality well rehabilitation in Illinois and most cost-effective solutions for the servicing of any and all the interior components of a typical water well facility. Our down hole televising services, Water Well Solutions can identify the problem areas in a well and coming up with the best possible methods for well rehabilitation in Illinois for each individual client. Our well rehabilitation in Illinois services are very reasonably priced compared to our competitors and are performed by true professionals that will get the job done on time and on budget. If for any reason you have any questions or comments about well rehabilitation in Illinois, feel free to fill out the form to the right and an associate will respond shortly or give us a call at 888-769-9009. 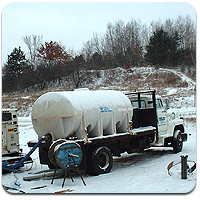 Just a few of our recent water well repairs success stories include Oscar Meyers, WI; Lyondell Basell, IA City of Lake Geneva, WI; and many more throughout Iowa and the Midwest. Please feel free to contact us for a list of references.